Every Terry Pratchett fan has an opinion on the best place to enter the Discworld series, but this is where it all began – on 24th November, 1983, The Colour of Magic was released into the world. 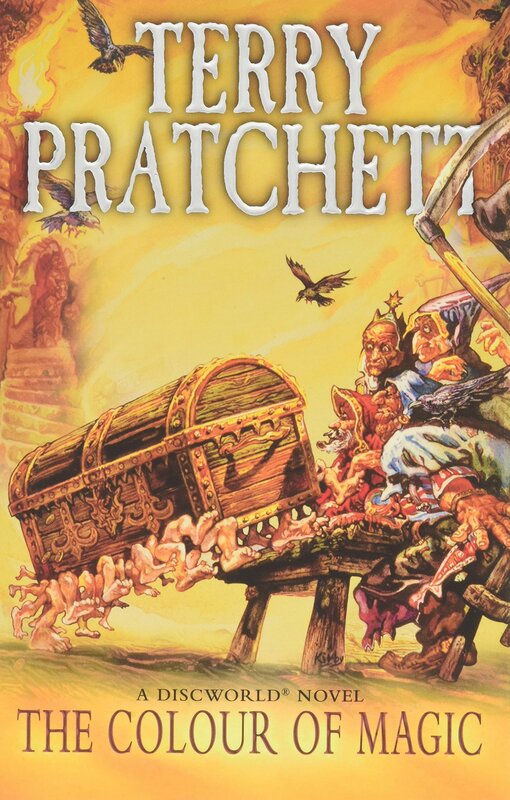 Although Pratchett had published several other books before its release, The Colour of Magic marked our introduction to the Discworld and many of today’s best-known Pratchett staples, such as the turgid city of Ankh-Morpork, the Thieves’ Guild, and, of course, Death himself (who loves curry, cats, and can be spotted in all but one of the series’ forty-one books). The novel follows the travels of the cowardly wizard Rincewind, who finds himself a guide for Twoflower, the Discworld’s very first tourist, followed by his sentient Luggage. Pratchett lovingly pulls apart and parodies tired fantasy tropes before piecing them back together to tell a truly brilliant story of semi-imaginary dragons, tavern fights, and insurance salesmen. Although his future novels refine this to perfection, his wordplay is second to none – Pratchett’s sense of humour feels as though he’s poking fun at you and laughing with you at the same time. And behind the ridiculousness of it all lies wicked satire, sincere philosophy, and a genuinely emotional story, laying the foundations for the series to come. The novels were given the movie treatment back in 2008, but the fact that Pratchett’s immense prolificacy and popularity have spawned relatively few TV and movie tie-ins speaks to his skill with words – it’s impossible to properly replicate his wit and storytelling skills outside the covers of his books. Astute, original, and just so much fun to read, The Colour of Magic is the perfect beginning to a series which has had a lasting impact upon millions of fans, and undoubtedly changed the face of fantasy and British literature.